Fun Homeschool Mom Blog: Where is Your Parenting Focus? 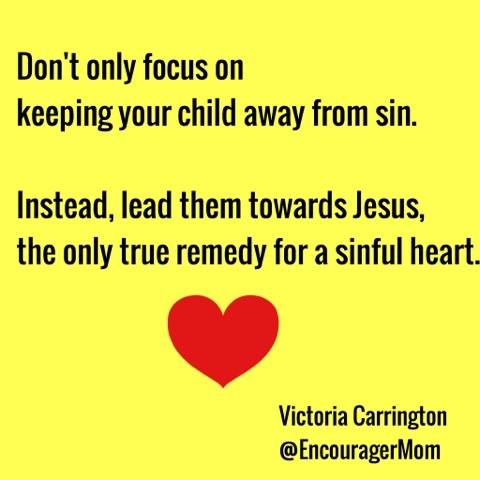 It seems that many Christian parents are so consumed with keeping their children from sin that they forget that as parents we have an even higher purpose. Our job is to lead our children, given to us by God, to a relationship with Jesus, the only true cure for a sinful heart. Truth is, folks say they believe in the power of Jesus but they don't act like it. We all know intellectually that we can not change anyone's heart on our own. Yet, we are content with what appears to be non-sinful behavior in our children. We want them to be on their best behavior. Is our focus on our children's behavior instead of their hearts only due to our sin of pride? Do not be comforted by outward behavior. Only rest once you know your children enjoy a rich, deep relationship with Jesus Christ. Encourage them to seek the Lord even before they consult you. Let them see and hear you relying on Jesus for daily guidance in decisions big and small. Jesus is our only hope against the sin condition. That is true for our children as well.